I finally have the bed back in the master bedroom! Most everything in the room is done. There are just a few details here and there that I want to get done but I couldn't really wait much longer to show yall the room. I'll share the additions as I do them. I love the thought of Christmas lights in the bedroom year-round but after seeing this picture, I thought there were too many lights. I have ordered a different strand with less lights and it should be here soon. The skeleton key belonged to Sun Kissed Husband's Grandmother. I thought it was cute dangling off the branches. An ode to "the key to my heart" sort of thing. 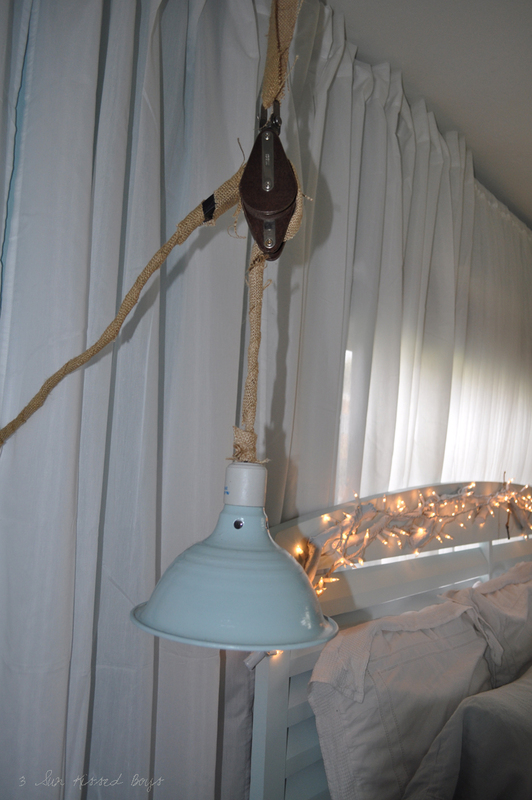 The Christmas lights are hanging off tree branches that I spray painted and drilled on the headboard. 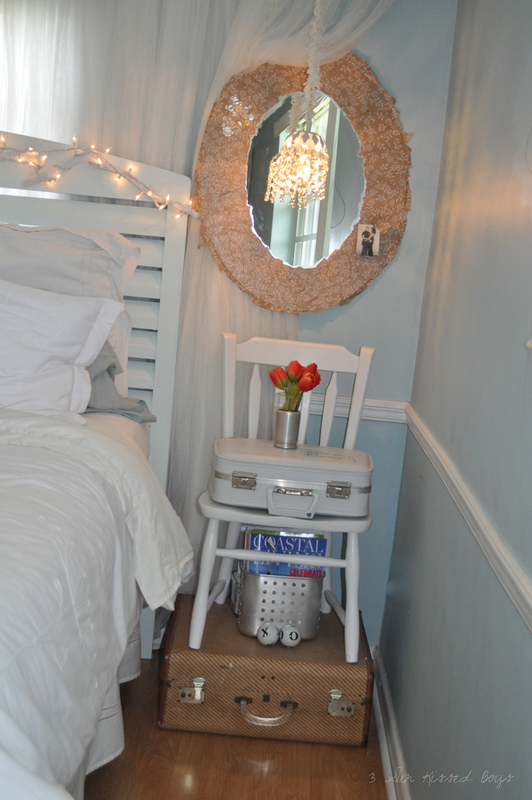 The chair/suitcase nightstand stayed the same. I just replaced the lamp with a chandie. 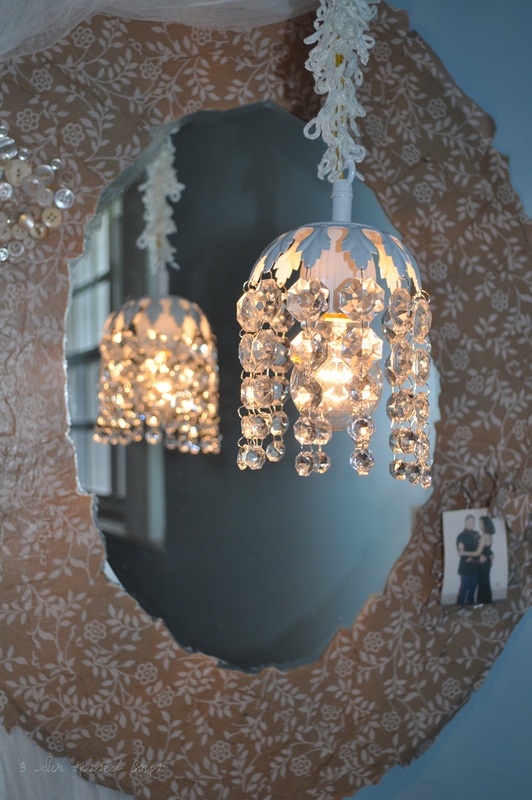 The chandy is a curbside find! Read about it's transformation here. 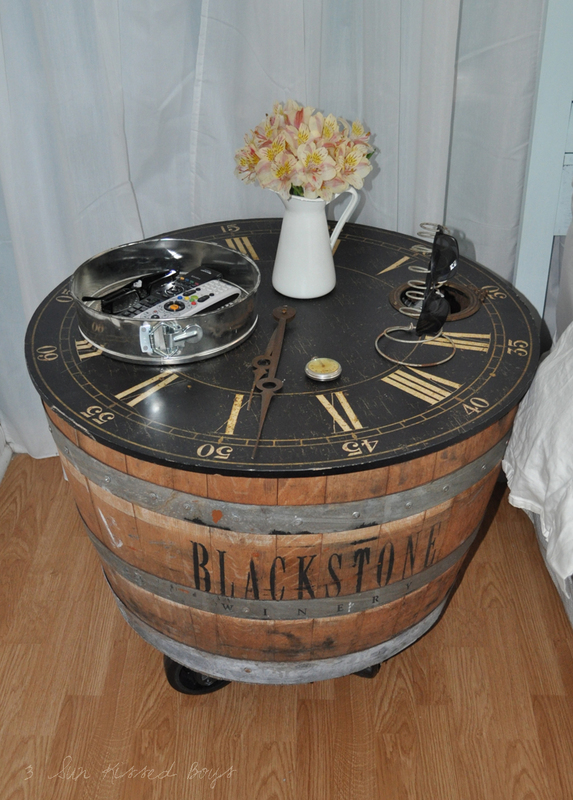 Sun Kissed Husband's nightstand is now half of a wine barrel on casters with a clock as a top. More details on it in this post. This hanging lamp use to be a work light. I bought it for a couple of bucks at a garage sale but they do sell them at hardware stores. 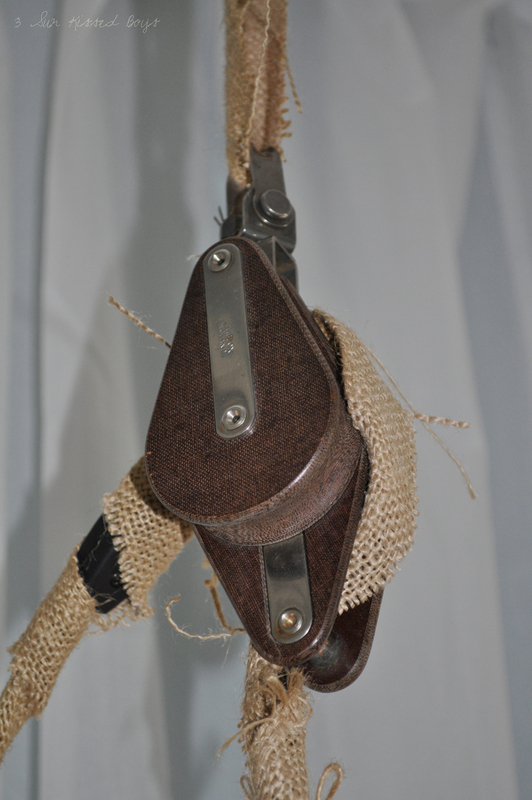 I wanted to incorporate a nautical touch on his side so I undid the wiring to be able to string it on a sailboat pulley block Sun Kissed Husband bought some time ago at a nautical flea market. The pocket watch brings back memories to both of us. It belonged to Sun Kissed Husband's dad. It reminds me of my grandfather's watch repairman days. 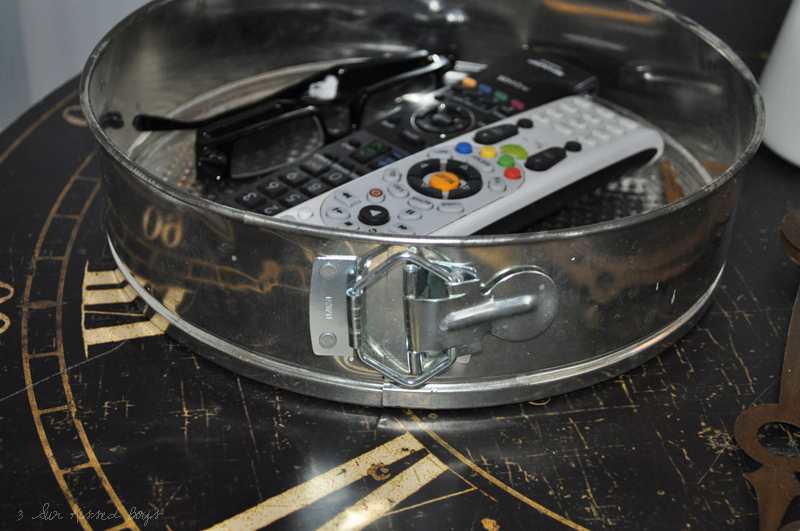 The spring pan keeps remotes and other things contained. 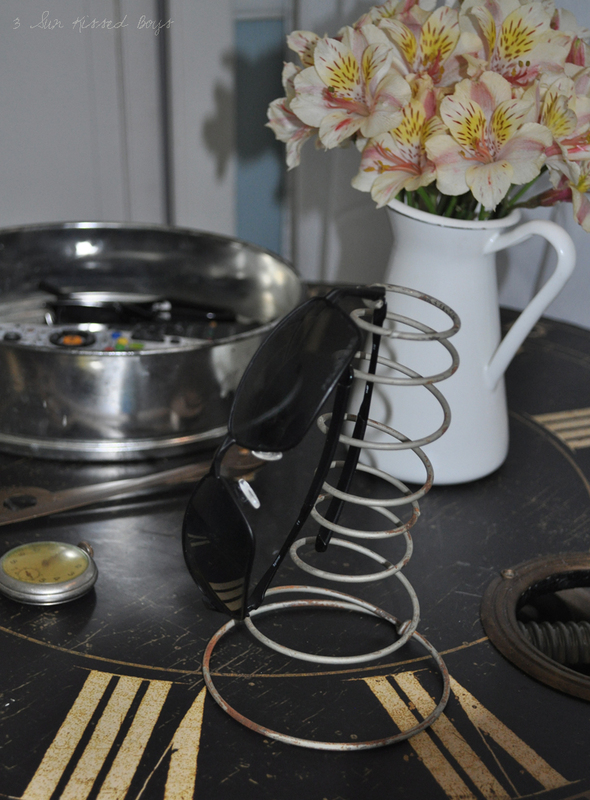 In keeping with the "spring" theme, this mattress spring, that Suzanne sent to me, gives the sunglasses a home. 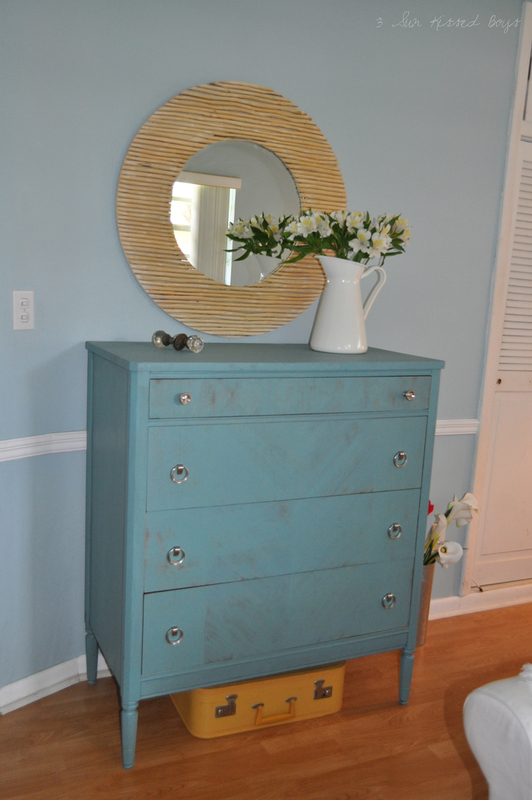 I brought the turquoise dresser from the living room giving me much needed storage space. 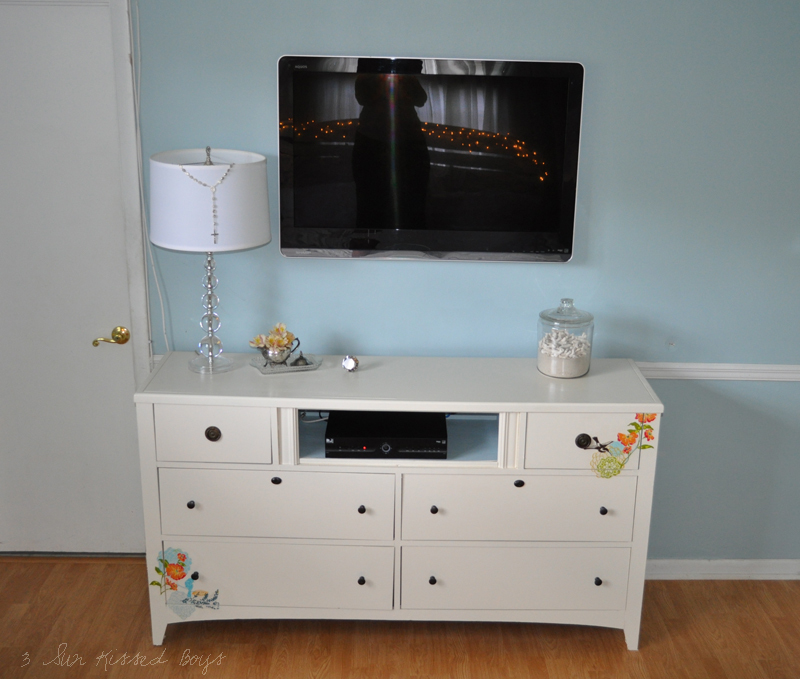 The furniture that underwent the biggest transformation was this dresser. Check here for more details. Expect for the curtains and the TV, most of the things in the room I already had. 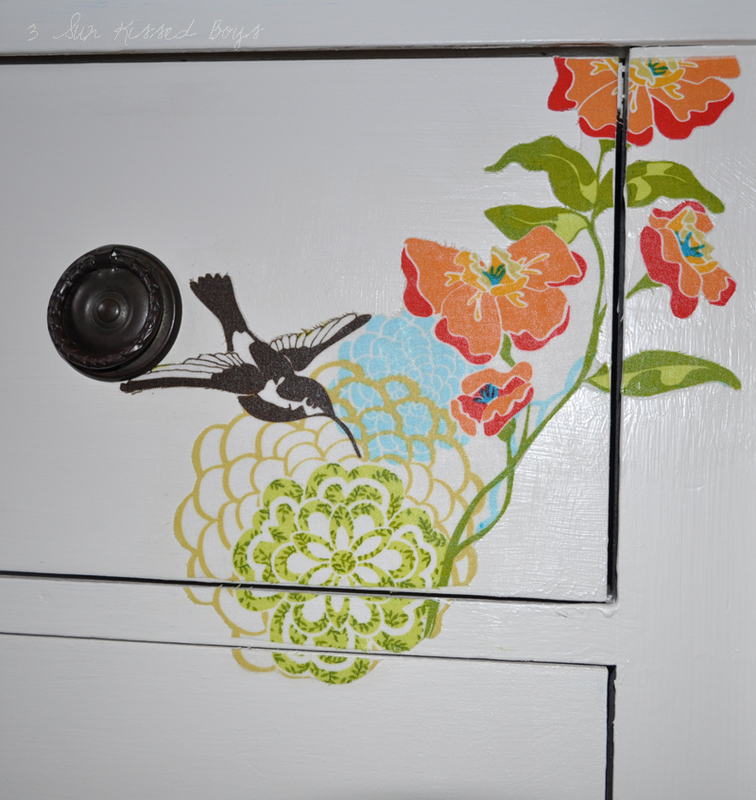 They were repainted, repurposed, or reused. My favorite is the wine barrel side table too. It's so unique. You did a great job on the project. You have no idea how stoked I am to see that barrel side table. We have barrels sitting outside that the hubs recently turned over to me as he is stumped on what to do with them. I had never considered using them inside! 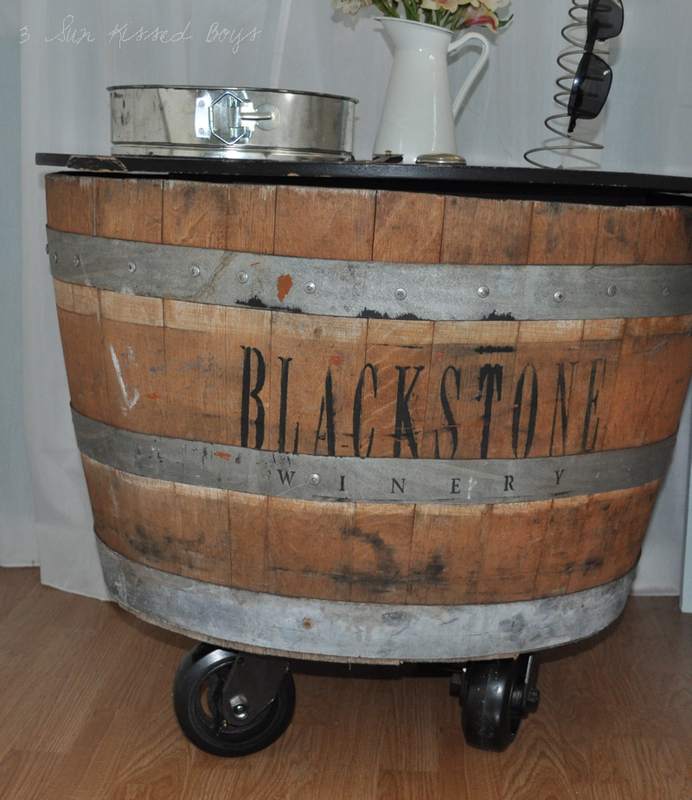 After seeing it on your blog it hit me: barrel coffee table w/ casters! Thank you for the inspiration. Your bedroom is beautiful! Came together nice!! I love the curtains behind the bed and love the idea of attaching branches to the headboard! Hopefully the "lighter" strand of lights makes the branches pop a bit more!! Great room! 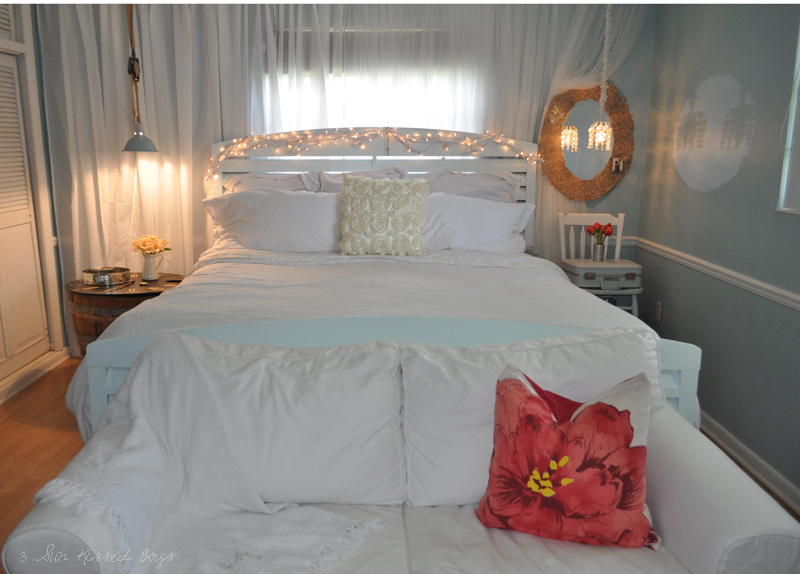 I love the romantic, girly, rustic, beachy, eclectic look! Gorgeous! I really, really love that barrel table...so cool. Great job Yanet! I love it and I love your blog. I am not at all artistically gifted and I feel so inspired when I look at your photos! Yanet, your makeover looks great. I love the bed. It looks like a cloud. Be sure to stop by my blog tomorrow to enter my giveaway. very pretty. has a soft, romantic look to it. 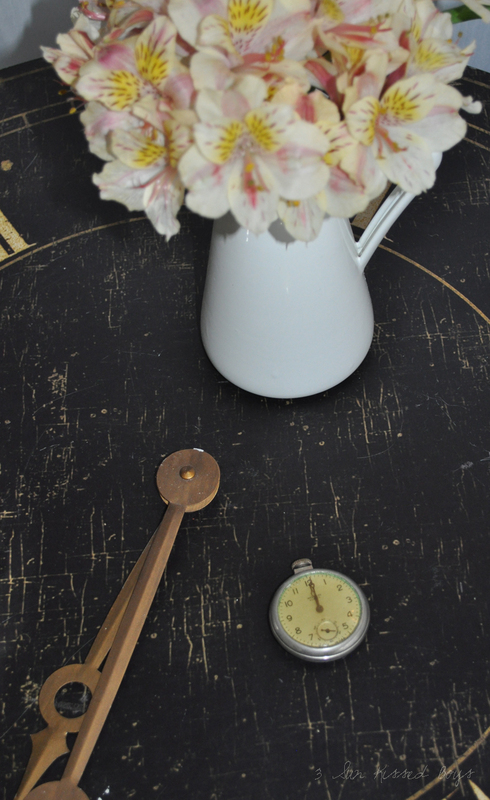 and i absoulutly love the barrel clock table , very unique - love it!!! Yay! You are almost done! It is whimsical and fun!!! Thanks for sharing with us!!!! It's beautiful. Seriously more than "good enough." Love love the relaxed vibe in this room. Nice job. Yanet this is stunning!!! What a beautiful and serene room you created! I LOVE the wall behind your bed and your headboard is perfect with the branches and lights, I bet it is so pretty at night! 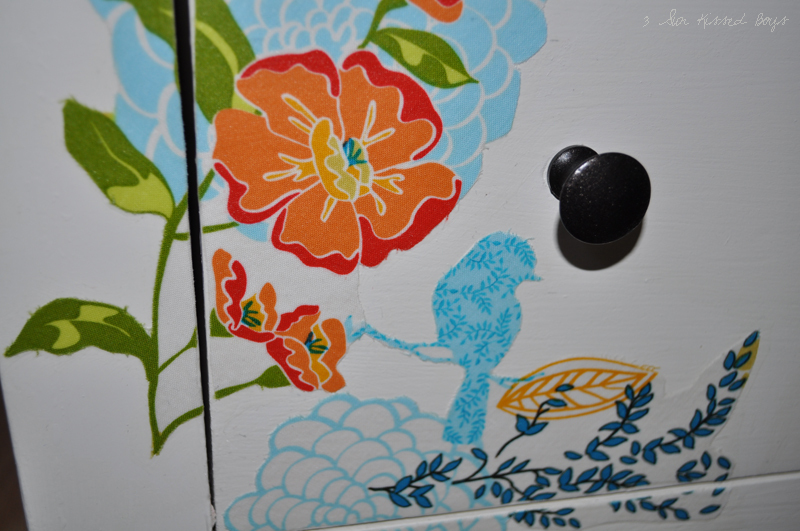 Love the pendants on each side and how they are different and the nightstands are beautiful! I just love everything!!! It all looks so soft and romantic! I love the barrel table. It's a nice contrast to the white. I also love that you have room for a loveseat at the foot of the bed! I think it is amazing! I love all your attention to details. Very nice! Love your room, so pretty. This is my first time on your blog, I love it! So gorgeous and romantic. Just beautiful!! 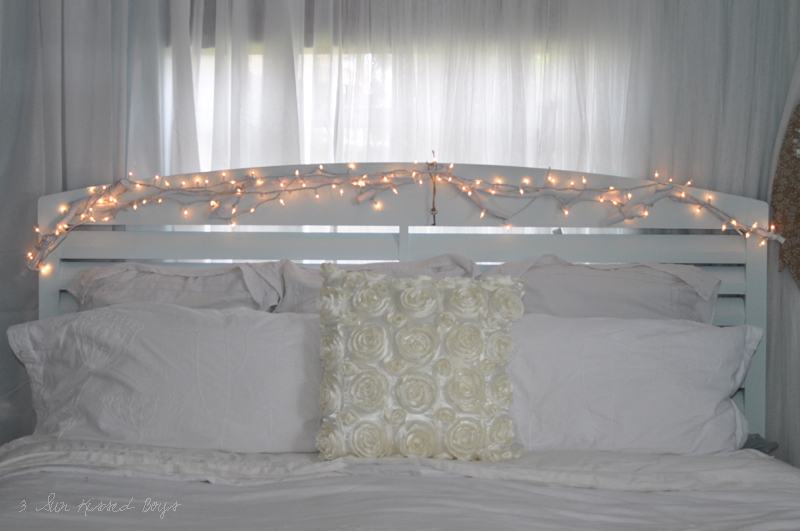 You've created a nice, light and airy romantic bedroom! Dropping by from Met Monday. 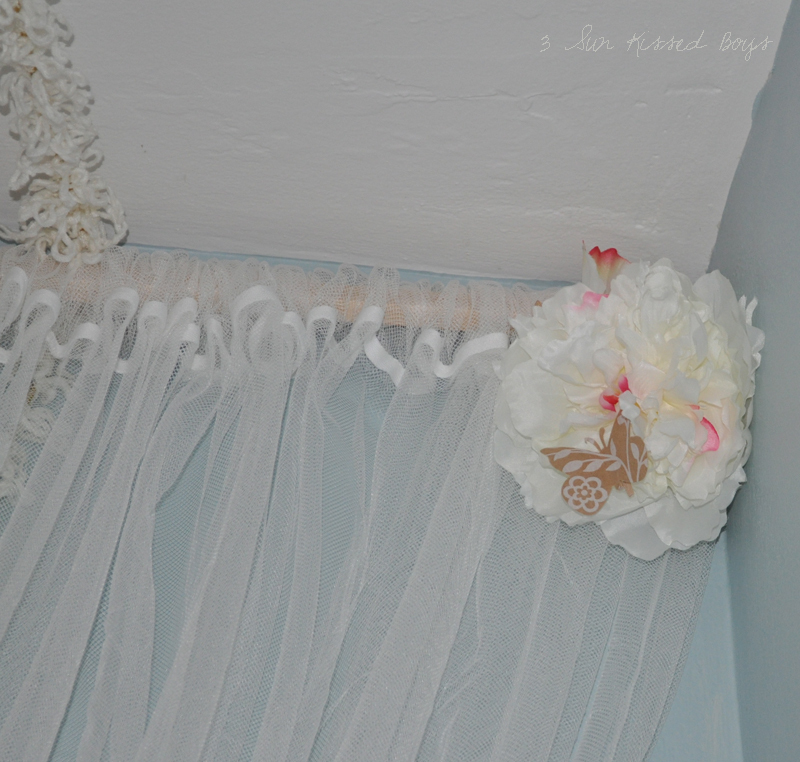 I hope you'll come see the nursery I helped DD2 create. Janet, everything is so pretty and creative. I love the branches and lights. and my favorite has to be the chair and suitcases sidetable! so sweet. 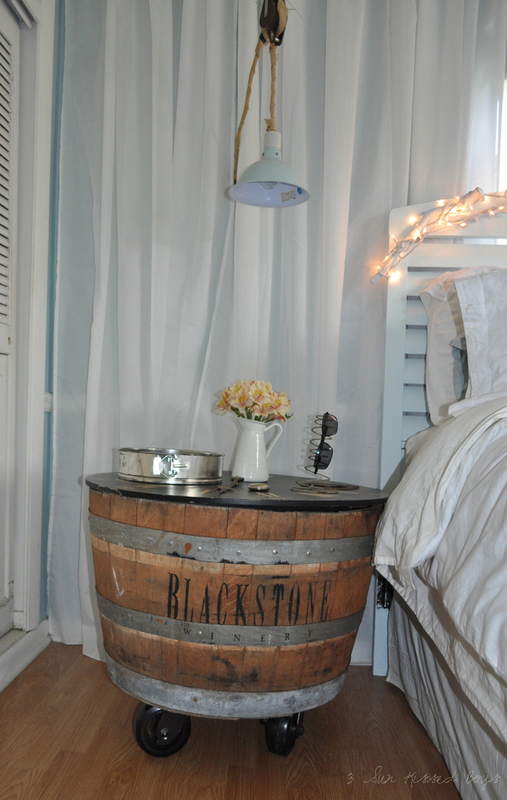 Love the barrel nightstand sooo different.